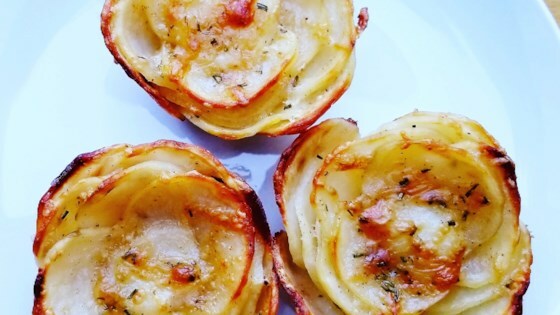 "Baked rose-shaped potato gratins would be great for entertaining, since you can make them ahead, and keep them warm in the pan, or cool and reheat in the oven when you are ready to serve. The technique is straightforward, but make sure you season the potatoes generously." Preheat oven to 400 degrees F (200 degrees C). Generously grease a 12-cup muffin tin with melted butter, reserving the rest for the potatoes. Slice potatoes to about 1/16 to 1/8 inch thickness using a mandoline or vegetable slicer. Discard end pieces that are mostly skin. Place slices in a bowl and add rosemary, salt, black pepper, and cayenne pepper. Drizzle in the remaining melted butter. Toss with your hands to evenly distribute, about 2 to 3 minutes, trying to separate all the potato slices. Grate about a quarter of the cheese over the potatoes. Toss. Add more cheese; toss again. Continue until all cheese is incorporated. Stack potato slices in uneven layers (to resemble flower petals) in prepared muffin tin, ending with some of the smaller pieces. Bake in preheated oven until potatoes are tender, 45 to 60 minutes, testing with a metal skewer for doneness. Potatoes should be very soft. If potatoes look too brown but aren't yet cooked through, cover pan with foil for the final minutes of baking. Loosen edges of potato roses with a fork and lift out of pan to serving dish. The humble potato as a romantic gratin! In place of the 1 tablespoon fresh rosemary, you can use 2 tablespoons fresh thyme leaves. 4 star on taste however, it basically ruined my muffin pan and i broke a rubber spatula trying to extract them. Presentable and very tasty. My Easter dinner guests were very impressed. Mandolin came in handy. I used disposable muffin tins for easy clean-up. Will definitely make these again. Thank you CJ. This recipe is excellent. Important to use Yukon Gold as recipe states. also watch the video and you can't go wrong. Excellent! Without much artistic ability, I had to use the extra large muffin tin. Looked impressive and tasted great. Thank you!